Megan, aka Kwicher Naggin, is a strikingly dark brindle 5-year-old female born May 8, 2007. Megan's sire is Frank Furter and her dam is Cals Clever Kara. Megan has 107 races to her credit on Greyhound-Data.com, starting October 15, 2008 at Dairyland. 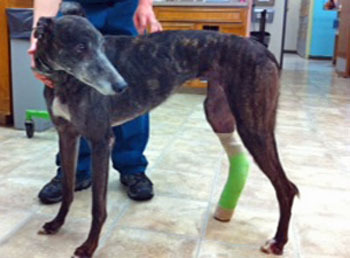 She then moved to the Bluff's Run track in 2009, Sarasota in 2010, and finished her career at Gulf Greyhound Park in Texas with a torn plantars ligament on February 15, 2012. Megan was under the care of Dr. Stephen Kerpsack at Central Texas Veterinary Specialty Hospital in Austin, who peformed surgery on February 29th. 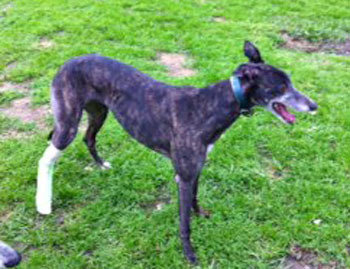 His diagnosis was a right intertarsal joint (ankle) dislocation and plantar ligament rupture. She received an ankle joint fusion with a 5 hole 2.7 mm plate applied along the lateral aspect of the calcaneus 4th tarsal bone with 3 screws placed in the calcaneus and 2 in the fourth tarsal bone. Megan stayed quiet with exercise restrictions in her foster home for 10 weeks, and has now been cleared by Dr. Kerpsack. He feels she has made a full recovery with normal function. The screws screw may have to be removed at sometime in the future if irritation occurs. It is not known if Megan is small animal or cat tolerant.